Home News Leaks Samsung Galaxy A20e Certified on Bluetooth SIG and Wi-Fi Alliance, Launch Imminent? 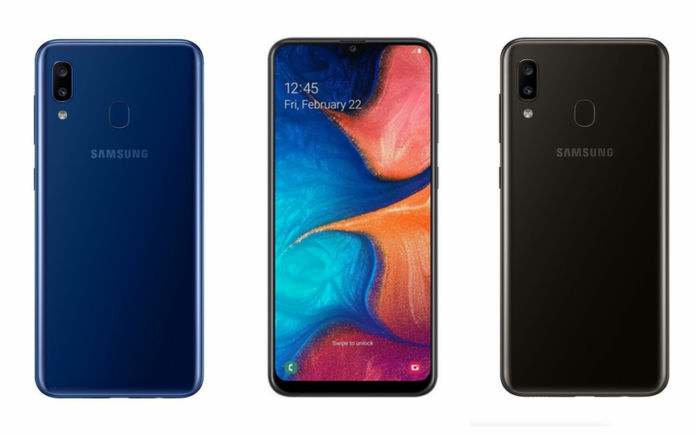 Last week, Samsung expanded its latest Galaxy A-series lineup by launching the Galaxy A20 in Russia. 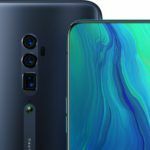 It now appears Samsung may soon introduce a variant of the Galaxy A20 dubbed Galaxy A20e. 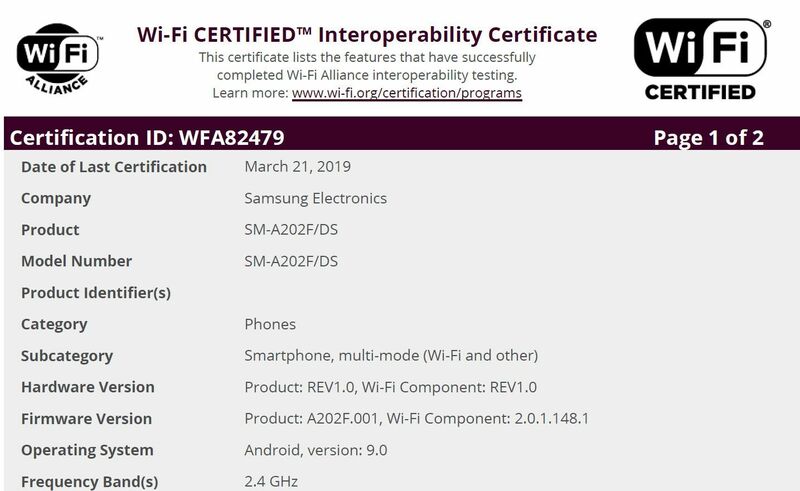 The smartphone has been certified by both the Bluetooth Special Interest Group (SIG) as well as Wi-Fi Alliance. 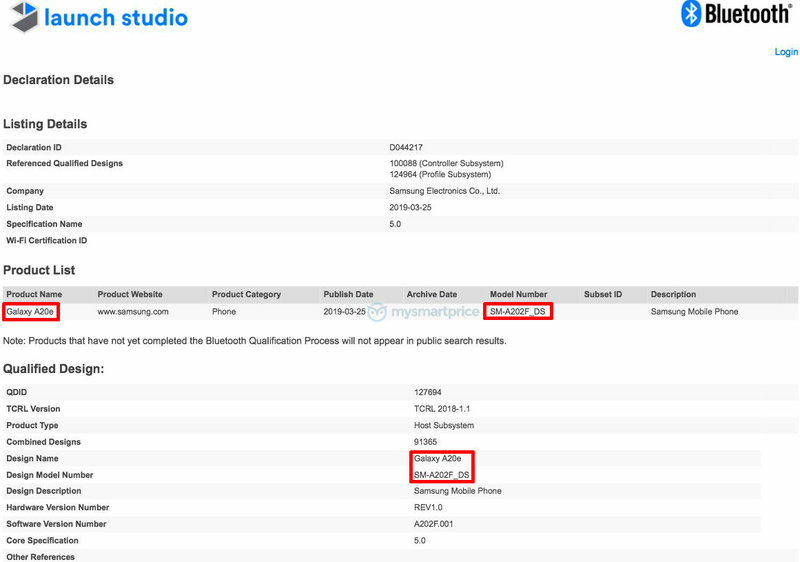 Apart from confirming its marketing name, the Samsung Galaxy A20e Bluetooth certification confirms the smartphone will have support for the Bluetooth 5.0 Low Energy standard. 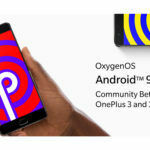 On the other hand, the smartphone’s Wi-Fi certification confirms it will ship with the latest Android 9.0 Pie operating system. 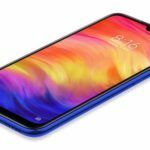 Unfortunately, however, the key specifications of the Galaxy A20e have not been confirmed yet. It had appeared on the popular Geekbench benchmark database last month, revealing an Exynos 7885 SoC and 3GB of RAM under the hood. The standard Galaxy A20 had also popped up on Geekbench with the very same hardware around the same time. This means the Galaxy A20e will run on the same Exynos 7884 SoC as the Galaxy A20. 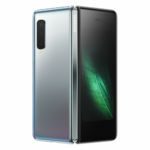 Since it has a different name, we can expect the Galaxy A20e to be slightly inferior to the Galaxy A20 in some areas. It is possible that the Galaxy A20e might be unveiled at the upcoming ‘a Galaxy event’ on April 10th. The Samsung Galaxy A20 features a 6.4-inch Super AMOLED Infinity-V display with 720 x 1560 HD+ resolution. It comes in a single memory configuration with 3GB of RAM and 32GB of internal storage. Thanks to a dedicated microSD card slot, users can expand the storage further by up to 512GB. 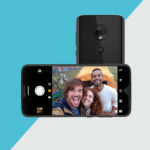 On the back of the phone is a 13MP + 5MP dual-camera setup. As for selfies, the budget Android smartphone comes with an 8MP snapper on the front with an f/2.0 aperture. The Galaxy A20 also offers a rear-mounted fingerprint sensor and packs a large 4000mAh non-removable battery. 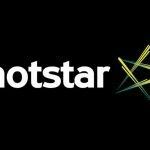 At this point, however, it is not known if the smartphone comes with fast charging support.